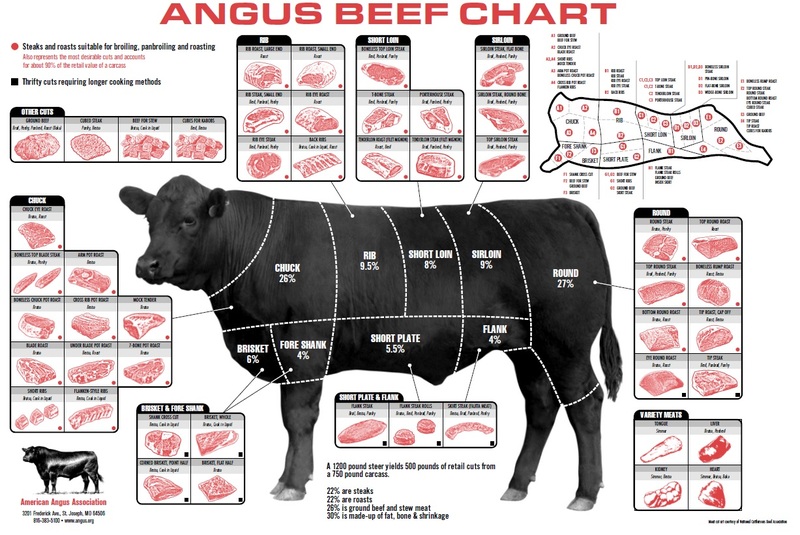 Click here for a larger image of where the each cut of beef located on the animal. We sell custom processed beef which is a quarter, half (side), or whole beef. Our cattle are live at the time of order and need to be slaughtered, dry-aged, cut, and frozen before delivery. The process takes around three weeks. The price is $4.25 per lb. on the hanging weight. For those not familiar with the term hanging weight, it is the weight of the animal after it is slaughtered, hanging at the meat locker, cooled, and aged. A side will often yield approximately 22% steaks, 22% roasts, 26% grind, and 30% bone, fat, & shrinkage. This will vary depending on how you have it cut, bone in / bone out. Iowa State University has a whole animal meat buying guide that explains some of this process for consumers. This document is one of the better meat cutting explanations that I have found on the web. It covers both beef and pork in detail. It is highly recommended reading for those that want to know more about buying a side of beef or pork. Please contact us if you would like a side of beef cut, wrapped, and delivered. We typically take orders for beef in the fall through spring. Send us an email if you are interested. If you want to try our beef cooked to order, then take a ride up the ski lift at Alta and enjoy a juicy hamburger at Watson Shelter.